Description: Refraction of sun light due to cold dense polar air under warmer thermal layers causes an increase in brightness almost unknown within present physics literature. Global Warming may be seen by studying simple satellite picture archives. Low on the horizon polar sunsets have sun disks compressed into a line. 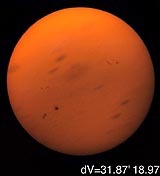 Thermal Inversions cause equally an increase in brightness during twilight. This page contains a vast database pertaining to temperate and polar sunsets. It also holds many differential refraction pictures, at multiple Zenith Angles. Recently conceived twilight brightness theory with respect to the Y-V Ulluq Q effects are presented. Extraordinary Moon shots show simple refraction. The data is there for you to study, the thoughts are progressive from February 2001 till today, they change according to knowledge acquired from this page and from other pages as referred to below. The data presented is quite accurate, calculations if any can be verified, while past thought mistakes are left untouched, in order to leave the examiner review a fascinating journey in science. Major paradigm shifts will be explained on each individual pages, they will be recognizable by the date they are written. SUNSET SCIENCE. IV. Low-altitude refraction. By Andrew T. Young, Departnment of Astronomy, San Diego State University, Astronomical Journal, 127:3622-3637, 2004 June. Proves without much doubt that Astronomical refraction is caused in the Troposphere. This certain fact can help ascertain key measurements, as used on this webpage, helping to calculate the temperature of the lower troposphere, without MSU doubts, such as radiometer microwave satellite readings which fail to distinguish the Stratosphere from the Troposphere. Sea ice core temperature is an important player in sea ice horizons. Thermodynamically, with lab conditions, air cools faster than ice (in a dark place, like a cloudless night), when not warmed by sun rays, this would lower the horizon if so. But the ice usually has a significantly colder core than its surface warmed by solar radiation. This core cools the noon warmed sea ice surface faster than the air, which in turn cools the interface air faster than the layer of air just above it. A colder layer of air under a warmer one is called an inversion. 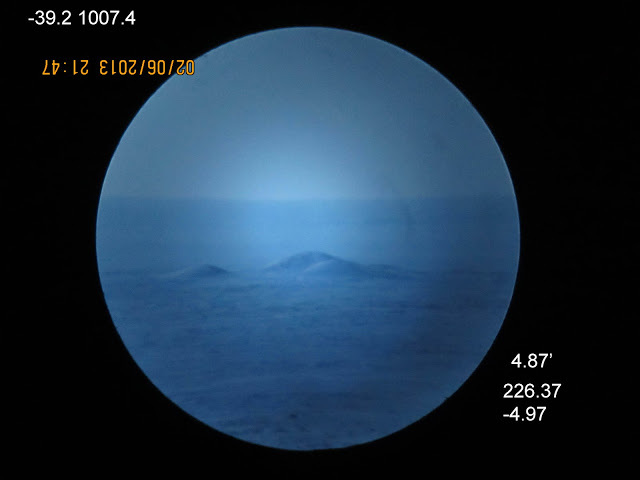 An observer can "see" this inversion by studying the horizon. After 2012 super synergistic melt. 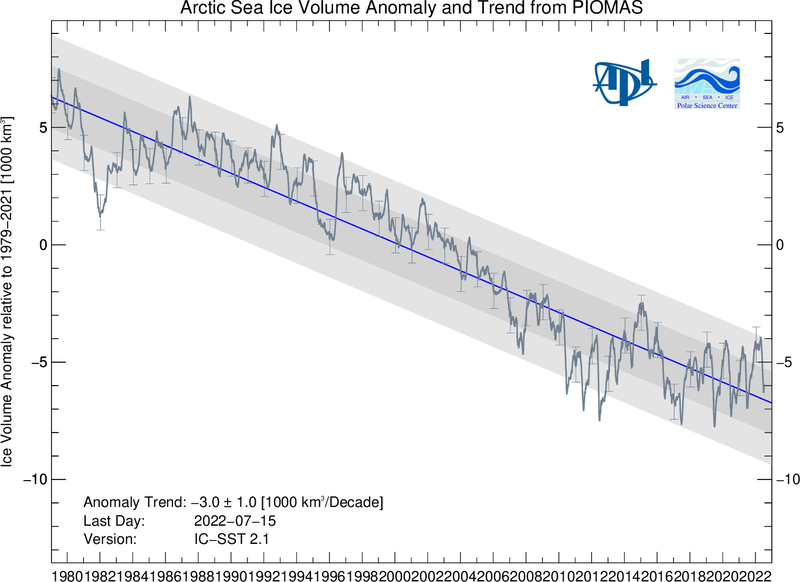 Arctic sea ice looked doomed. But the last thing most experts forgot, the one reason why 2012 sea ice melted so much was that all the weather elements were inclined to do so. Compaction was nearly as ideal as 2007, clouds and cyclones were scarce, along with clear blue 24 hour solar ray melting. The once thick expansive mighty multi-year ice pack was limited to a thin sliver of the NW Arctic Archipelago coast. 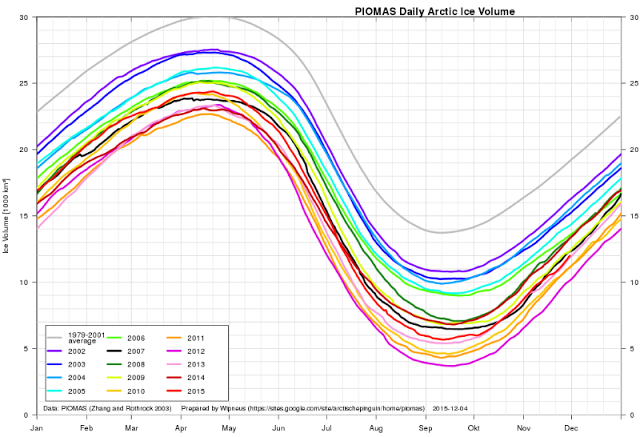 And so it looked like the next few years we should have seen a whole lot of less sea ice. That wasn't so, not because weather varies from summer to summer, but especially, ironically, it takes thick sea ice to create summer Arctic dipoles creating great compactions. The next few melt seasons were lesser, because there was far lesser compaction and much more clouds (cooling) especially from ever so persistent summer cyclones over the Arctic Ocean. "Mystery Beneath the ice" was about plummeting krill stocks in Antarctica. The way to measure sea ice thickness over its entire region may be very complex, and definitely requires satellites with resolution capacities approaching 1 meter. But there is another way, horizon refraction measurements capture the lapse rate of the sea ice to air interface instantly, ultimately simplifying the effort of measuring things meter by meter. Instead an horizon photograph encapsulates the actual over all thickness of the sea ice as well as the temperature of its air right above, over a huge area at once. Although there is still a lot of sea ice, this years outlook is very bleak. The only thing stopping a further expansive melt are clouds and the positioning of cyclones during the summer season. The writing of 2015 warming was in sun disks well before year end. However, refraction prognosis methods are not only to be found with astronomical objects. 2016 is already significantly warmer than 2015 by another way to judge the warmth of the planet...... With sea ice. More on this soon. Temperature profile of the atmosphere about Iceland on December 29. From December 26 to 29 2015, the entire Arctic atmosphere significantly warmed in total darkness! An important Low pressure system, one following many, easily penetrated the North Pole region which had DWT temperatures usually close to -40 C, now more like -8 C, again this is the temperature of the entire atmosphere not just the surface, in the past not changing fast in a matter of days. In total -no sun - darkness the usual pattern was stable DWT's. Another marked feature of current 2015-16 season is this darkness warming, never readily noticeable in the past, as winter progresses it usually gets colder not warmer! Now we noticed with ease warming bursts at least 3 times since November 2015. The Cold Temperature North Pole (CTNP) and Arctic has warmed significantly since 1998. This allows Cyclones to penetrate a weakened state of winter which is made in great part in the Arctic, this affects weather world wide. But now, this is new, we witness temperature warming surges causing incredible dynamic changes undoubtedly which will continue to cause tremendously different weather scenarios, some good for warm temperature lovers, but will cause many severe stressful events for human infrastructures as much as on all ecosystems. Comparison gallery. And the 3 basic sunset science rules. Polarization at the POLES. Sounds strange? It isn't! The real argument Terminator! Showing that greater refraction exists at the poles. Old pictographic archives; one with the sun 4 degrees below the horizon. Sunrise, effects caused by a warmer atmosphere. Congratulations to Siebren Y. van der Werf and colleagues on this accomplishment. Text and photos by Wayne Davidson. Resident of Resolute Bay, Nunavut Canada. Siebren van der Werf, from Holland, has finally a webpage including down loadable Journal links, also with programs capable of calculating sundisk sizes, along with sunset and sunrise shapes with a great deal of accuracy. He is one of the few top notch refraction expert of this world. Reading his material will make you nearly up to date with the latest cutting edge knowledge, including differential formulas, his works are required reading. Ben Wheeler and Ethan Sollows. Andrew T. Young's web page "An Introduction to Green Flashes" is essential to understand other refraction effects near the horizon. Dr. Young puts to rest many misconceptions which are still ingrained everywhere. On his way to the North Pole, Gunther Kletetschka, a physicist, gave me a hand, pictures from his adventure can be found here. Very important sunset sequences can be found at Tom Ruen 's web page. He's a Lake Superior expert on this subject. Some pictures resemble polar pictures, proving that Lake Superior is a cold lake indeed. Zoltan Neda and other wrote 2 papers on the subject of sun flatness. Great pictures from space show a fantastic resemblance to pictures taken from Resolute Bay. The Red Star Project: Figuring out how much ozone you have above your roof without any instrument. Stonehenge Then: Many of the sun disk transformations found on this web page ressemble Megalithic structures found throughout the UK, Ireland and Northwestern Europe. Stonehenge Then is a web page designed to recruit more research in horizon observations at Megalith sites. It contains many theories which need field workers to confirm. These theories need to be checked out by hopefully volunteers, or eventually myself.